Last Update: March 26, 2019 Hello Guys! If you are planning to settle in a new place the first thing that comes to your mind is a refrigerator. It’s quite advantageous to have a refrigerator at home as it stores your food and is capable of preserving fruits and vegetables for the week as well as cool water all through the summer. Of course, you would want to have the best refrigerator when purchasing one. There are however certain factors to be considered before purchasing your refrigerators at home. You also have to consider the best refrigerator brands that are available in the market. Look for brands that are stable and have good customer service. Do I need a stabilizer for my refrigerator? What does toughened glass mean? What is the power consumption per year? Does my refrigerator need yearly maintenance? Can I extend my warranty after I purchased my refrigerator? Should I be worried if I hear sounds from my refrigerator? It is a large appliance and hence it is obvious to do proper research. We have brought down the list of the best refrigerators for you in this post which you can purchase online. This is the most common type of refrigerator that we all have at home. The freezer has a separate inner door and the fridge includes a vegetable box at the bottom. Not only is this type the most common, more often it is also the cheapest. With new technology and innovations added to all different kinds of refrigerators, this one-door type is getting all the upgrades and are still loved by many. Generally, single doors also consume less power compared to multi-doors plus if you only live alone or a couple or with just one or two kids, this is still the best kind of refrigerator for you. Varying from different sizes, this type of refrigerator usually has a lower level for easy reach for the top. Although it may sound too short for your taste, the top freezer refrigerator is ideal when we talk about budget friendly. It is less heavy in the pocket than most refrigerators do. Side-by-side refrigerators feature the freezer and refrigerator standing vertically right next to each other. Both sections are slimmer than most ref models, and upon swinging one of the doors open, it helps saves a lot more space. It is also one of the affordable types out there. This type of refrigerator gives your kitchen a fancy restaurant look. With three doors to open at a time, escaping of the cool air is minimal, meaningless expenses on electricity bills. French door refrigerators are usually large and take up a lot of space, though. Mini fridges are ideal for those who live by themselves or for newlyweds to start anew. From the name itself, this small package provides the average power of cooling food. This type can come in different variations. Now that we have discussed the different types of refrigerators, you can now have an idea which refrigerator would be best for you or your family. Keep these things in mind as you read the list of reviews on this page. Lastly, here are additional considerations to make before buying a refrigerator. We want you to think wisely for the best refrigerator that is the best fit for your family or household. Before buying a refrigerator, consider its dimensions. Will it fit through your front door? Will it take too much space in your kitchen? Will it fit through the reserved space meant for installation? Will it store enough food for you until the next time you buy groceries? Use a measuring tape to measure up your space for installation, as well as all the doors where the appliance will have to go through. Consider how your food compartment and freezer is laid out. If you’re one who doesn’t eat frozen food on a regular basis and considers their diet on fresh food, then it is ideal for you to buy a top freezer refrigerator. If you want to keep an equal amount of both fresh and frozen food, a side-by-side refrigerator is more likely for you to buy. From wire shelves to glass shelves, they can be available in refrigerators bought online. Check your ideal refrigerator if they are adjustable, spill-proof, and such. We have given you additional guides to choose the best refrigerator, so make sure to use them. Having a refrigerator is essential for one’s home. The appliance serves to store our food and helps keep it fresh and cool. Most refrigerators bought are taller than an average human, since we tend to keep a considerable amount of food that may last for a week or so. However, there are refrigerators that are small enough for personal use or for family starters. Here, we have gathered the most efficient refrigerators that can be found in Indian online e-commerce sites so you could at least get a satisfying experience in getting a suitable refrigerator. 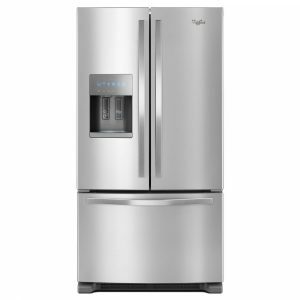 We found the best refrigerators that have been reviewed for you. 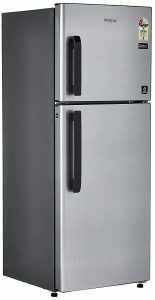 The Whirlpool 260 L Frost Free Multi-Door Refrigerator (FP 283D Protton Roy, Mirror White) has three doors stacked on top of each other which builds height. This height gives off more space for freshening the food. Its center door is designed to be bigger compared to the other two doors so the individual using it just have to stand up straight. Aside from that, the white color of this model gives your kitchen a neat and clean look. LG 260 L 4 Star Frost-Free Double Door Refrigerator (GL-I292RPZL, Shiny Steel) is a classy steel material coated refrigerator of LG and is very common because of its best after-sale services. Its performance and power will surely satisfy you in keeping your ingredients in quality. This model also a smart invertor compressor for great operations. LG has won worldwide appreciation because of its customer satisfaction. It is totally recommended. The Haier 320 L 3 Star Frost Free Double Door Refrigerator is an efficient appliance suitable for small families. This ref has a 360-degree airflow to keep your food fresh and cool through the power of one-hour icing technology. The model has a voltage of 240 volts and a food capacity of 234 liters. It was rated as a 3-starred rating for its performance and received positive feedbacks. 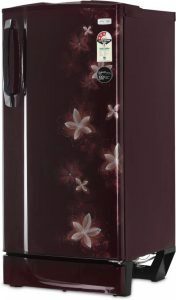 This lovely floral ref is the LG 190 L 4 Star Direct Cool Single Door Refrigerator is an advanced and efficient energy compressor. The model uses Smart Connect technology for great performances. It is also compatible with inverters, so no worries when you power get interrupted! It has been testified that this appliance is reliable and durable and great for heavy food ingredients. The Samsung 253 L 2 Star Frost Free Double Door Refrigerator is a double door type and features well-grounded operations through the help of digital inverter technology. It features an easy side shelf design which helps you avail your food easily. The model is compatible with an inverter as well. It also maintains the temperature equally from top to bottom to keep your food fresh. 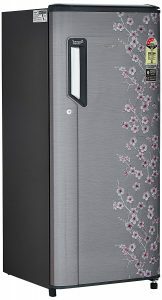 Whirlpool Fp 263D Royal Frost-free Multi-Door Refrigerator (240 Ltrs, Alpha Steel) is a three-door refrigerator with a total capacity of about 240 Litres. The Whirlpool is a reputed brand and also provides inbuilt technology like- Moisture Retention Technology, Macroblock, Freshkeeper, Air Boosters, and 3 Door Format. The refrigerator is very modern and compact and totally steals your eyes in the kitchen. 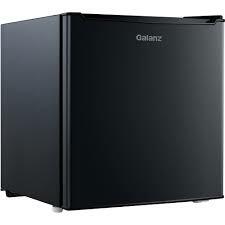 It is one of the best selling refrigerators and has been successful in winning many hearts online. It is totally recommended for all household needs. This elegant blue refrigerator is a modernized version of many’s favorites. It’s stabilizer-free so it is reliable on occasions of voltage fluctuations. It also has 9-hour cooling retention should the power cuts off. It’s a refrigerator integrated with technology built for an Indian household. It also comes with a removable anti-bacterial gasket perfect for sophisticated housekeepers that always want their fridge perfectly germ free. The shelves of this model are a wired type shelf. It received a 3-star rating and is recommended. This Whirlpool 245 L 2 Star double door refrigerator makes more space for your frozen delights. This ref has a capacity of 245 liters while its voltage reaches to 250 volts.It comes with the 6th Sense DeepFreeze Technology that provides deep freezing with a circular air flow while consuming minimal energy. This Whirlpool refrigerator not only have an anti-odor feature but has a fresh flow air tower that keeps a long-lasting freshness. It also comes with a user manual for further instructions. 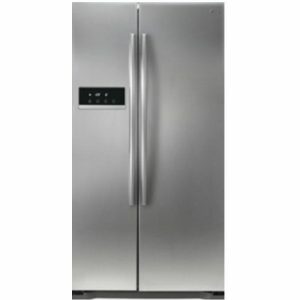 This classy looking Samsung 212 L 3 Star is a single door but a fully functional refrigerator. It has a good capacity of 150 kilograms built with a toughened glass to support it. Not only is it classy in front but also at the back. It has a safe clean back that protects the internal components of the refrigerator and also makes it easy to clean at the backside. It also features a digital inverter compressor that makes sure the pressure is just the right one you need. This Single Door Godrej 185 L is so personalized that not only is the shade and floral print very visible but it comes with a built-in MP3 player. This is best as a personalized refrigerator to have in your own room or if you are living alone or just with your partner. It is also environment-friendly as it is CFC, HCFC, and HFC-free! So if you want a refrigerator that got everything for its purpose – a freezer and a cooling place with a music player then this Godrej model is perfect for you. 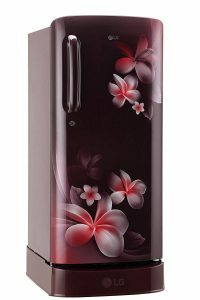 Another with a classy but floral touch design, this Whirlpool 200 L refrigerator is perfect for personal use or for a couple. This ref is a part of a series called Ice Magic Power Cool and features a single door. It may be small but this refrigerator has a powerful cooling feature even during a power outage and can keep the cooling locked inside for a long time. It is because this model features the 6th SENSE power technology. Haier 195 L 4 Star Direct-Cool Single Door Refrigerator (1954BS-R, Brushed Silver) is a perfect refrigerator with a capacity of about 195L. It can reach up to 240 voltage and it is energy efficient. It also features direct cooling as its defrost system. The refrigerator comes with a year’s assurance in the form of warranty. Haier is a reputed brand for its design and durability and therefore is a bestselling product online. This is recommended for all household purposes. There you go! Those are the 12 listed best refrigerator reviews we have online. Now check the questions that are often ask by many in relation to the use or purchase of their refrigerator. This may help you look for the one you want. Here are a few questions that you would often find yourself asking before buying a refrigerator. We have gathered them for you and hope it answered something you were thinking about. Generally, no. Most refrigerators are stabilizer-free or have a built-in stabilizer. But should your area be frequented with a power outage or you have large size refrigerator, it is best to check if you would need a separate stabilizer. It means that the glass racks inside your refrigerator can bear heavy items and not break. It means you can put your bowls of salads and baked goodies without worrying if the compartment can carry it. This all depends on how you use your refrigerator. The typical annual power consumption ranges from 180 to 220 units. Yes, just like most appliances, refrigerators needs to be check at least once a year. Ask the manufacturer if this is included in your warranty and include maintenance tips you may do on your own, too. Yes, and sometimes there are discounts upon purchased. But first, check if you are already offered a good warranty. Most refrigerators now offer 10 years warranty. First, determine what kind of sound you are hearing. If you hear a blowing or air rushing inside, these are most like cause by the fan inside. If it’s a dripping sound, try to check if it’s dripping due to water being drained out during a defrost cycle. If you just turned on your refrigerator and you hear the motor running loudly, this is normal at start. This should tone down after it balances the pressure inside. If not, you may need to have it check. It is a large appliance and costs around 10-30k depending upon the cavity space as well as the features inbuilt within the machine. The price is a big factor to decide which machine to opt for. It should be easy to use as it is an appliance to be used by all the members of the family. The settings might be needed to be changed at different weather due to the different settings needed. Hence the machine should be easy to handle. In the days of modular kitchen space is the very important factor that needs to be considered and hence you need to choose the appliance according to your requirement, for example, a small refrigerator for a family of four and a medium refrigerator for a family of 6. The one and only factor considered before purchasing any appliance is the durability of the appliance as no one wishes to buy a large appliance again and again after a major breakdown. There are many brands which offer a year or two’s warranty and it proves to be an added advantage for the buyer. We hope we got you thinking about the best refrigerator for you. We know you can now choose from the best refrigerators reviewed by many consumers. Share this guide to family and friends looking for a new refrigerator to help them find the best there is, too.